Today I'm going to review the BISSELL Lift-Off Steam Mop . I am so busy during the day running my boutiques, running after my 2 year old, and trying to keep the house and laundry done. It can become exhausting!! I'm sure some of you know that already though right? LOL! I was just tired of dragging out the mop bucket every time I needed to mop the floor. It was always messy and took so much time. I wanted to try something to cut back on time, but still get the job done right. 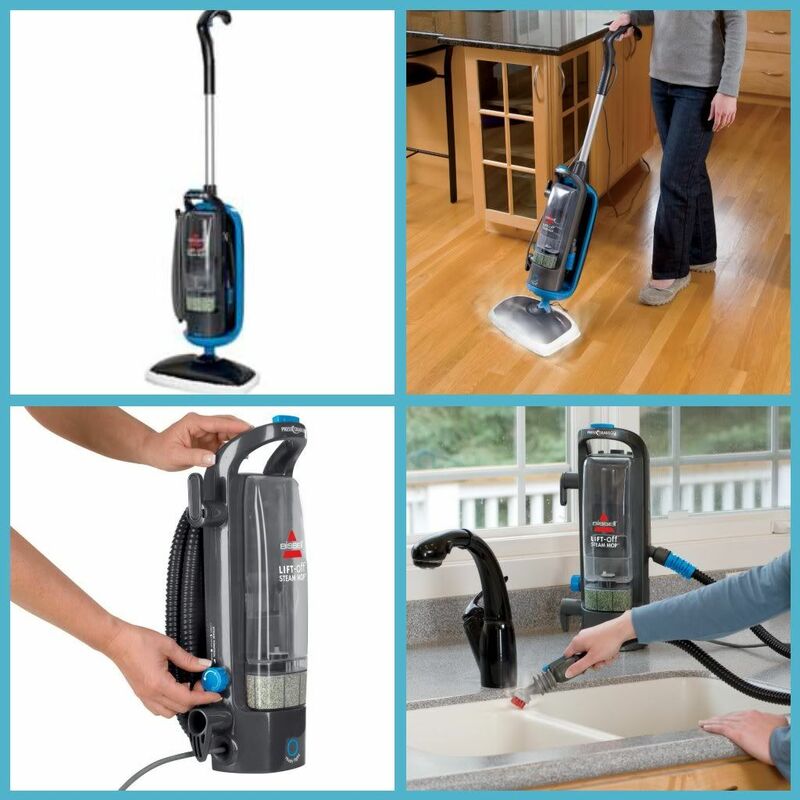 I had tried the Hoover FloorMate Wet/Dry Vacuum Cleaner a few years back as well as the H20 Mop . I was FAR from impressed with these two models. First the H20 mop, plain and simple it didn't work and the mop cloth kept coming off with the slightest of movements. It was a pain to keep readjusting it. It quickly went into the trash for me. The Hoover wet/dry vacuum was okay. I think if you have flat floors (not tile) it would be a good option. I bought the tile attachment and it still did a poor job of getting between the tiles. I did however love the wet pick up and dry pick up on the model. It was very helpful and I did use this model for a year. It is heavy and bulky though so I could only do so much at a time. It's a work out! NOW, onto the awesome Bissell Lift Off Steam mop!!! I was hesitant to spend more money on yet another auto mop device, but I'm so glad I did! I love the features this bad boy packs into such a small light weight machine. The steam flows nicely thru the floor pad and guess what!? The floor pad stays in place! The steam also reaches down into the tile spaces and the pad has little raised scrubbies on the bottom that cleans tile very well. The floors also dry very quickly. I really love that I am not using any chemicals on my floor anymore and I know that baby cakes is perfectly fine walking bare foot on the floor! You know how they love to put their feet in their mouths! LOL! No worries here anymore! The floor is spotless with only a small amount of water! LOVE IT! There is more though! When you get the urge to really get into cleaning the steaming part lifts off the machine and you can clean just about anything with this. It comes with attachments to make any cleaning job a cinch. You get small brush attachments as well as a nice little cleaning pad attachment. I use this on my kitchen counter tops, around sinks, and in the shower. It's amazing how well steam can clean! It's so quick to! Just wipe away whatever gunk it loosens up and your good to go! Hi there. Popping by from the Monday Mingle. Nice to meet you. I like the header here. Very cute. I just purchased a Bissell Lift-Off at Big Lots for $80, which seemed like a great price compared to Target. I had a Shark, which seemed to work great (well, anything is better than a bucket and mop!) but it broke after just a year and I really missed having something portable. Now that you've had yours for a few months, do you still like it?